Stomach-churning footage shows play dough-like pus being squeezed from a woman's armpit. The Beauty therapist, named Jada Kennedy, gently squeezes the inflamed skin, only for thick 'snakes' of pus to emerge. Ms Kennedy thinks the nauseating 'procedure' is over, only for further streams of pus to come rushing out. 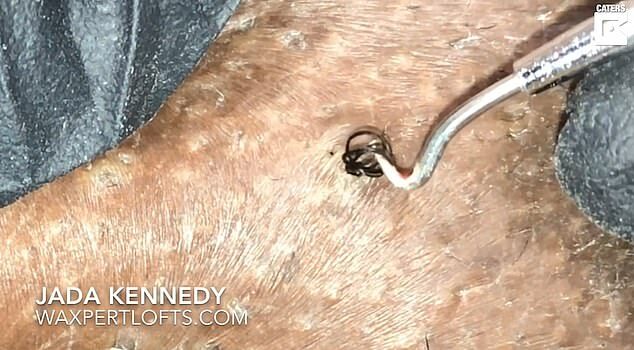 The clip ends with her pulling a 'hook' of ingrowing hair out of the patient's armpit. The footage opens with Ms Kennedy explaining to the viewers a 'new client has come to her'. 'Y'all are gonna be so amazed at what comes out,' she excitedly said. Without going into detail, she claims 'deodorant' may be to blame but adds 'it may be a cyst, I'm not a doctor, I don't know'.